One useful feature of RPA tools is screen scraping. Screen scraping involves capturing bitmap data from the screen and cross-checking it against stored information to decipher it. While it is not the fastest or most accurate method, the flexibility it provides with almost any application makes it a very favorable tool to have. This blog will describe the importance of being able to read and digitize screen elements, as well as provide pointers on the essential features to look out for. A common use of screen scraping is working with application interfaces that are not directly accessible through available UI frameworks or code. In these cases, data input and extraction requires manual navigation of screen elements. For example, an application within a Citrix window is inaccessible by any sort of code framework. However, surface automation allows the user to outline a box around the icon and label it accordingly. This region of the screen will then be recognized (pixel by pixel) by the RPA software as the application icon and can subsequently be assigned to be clicked when the form is complete. Using screen scraping for text is very common, when text from an application cannot be directly accessed through code or by navigating a UI framework. In these cases, the automation needs to capture and decipher blocks of text so they can be digitized. This is achieved through optical character recognition (OCR). Digitizing text often requires a more comprehensive toolset since it involves a new step of interpreting characters. Some RPA tools provide integrations with well-established OCR engines like Microsoft and Google. One step up from text recognition is the ability to structure data when reading structured documents. For example, a capable system might read an invoice and automatically categorize each section of it, saving a series of steps in the process, this type of process links cognitive algorithms with OCR abilities. The quality of surface automation depends largely on two factors: stability and speed. Stability is crucial because it ensures that the automation will have consistent actions. It would be inconvenient to use surface automation when a slight movement of the application window throws the whole automation off. Enterprise-level RPA tools combat this using features like image within image recognition to dynamically search for the coordinates of the desired field, preventing any errant clicks. Another feature that can be employed is an optimized image recognition algorithm designed to determine the image based on a set of rules that calculates the object coordinates. In terms of speed, surface automation is inevitably slower than a code-based, direct integration. The screen scrapers that make use of special techniques to enhance accuracy often give up speed as a result. In the worst cases, the more meticulous methods could end up magnitudes slower than their slimmer counterparts. Hence, a cost-benefit analysis is recommended. The ideal screen scraping qualities will depend on your business’s needs. 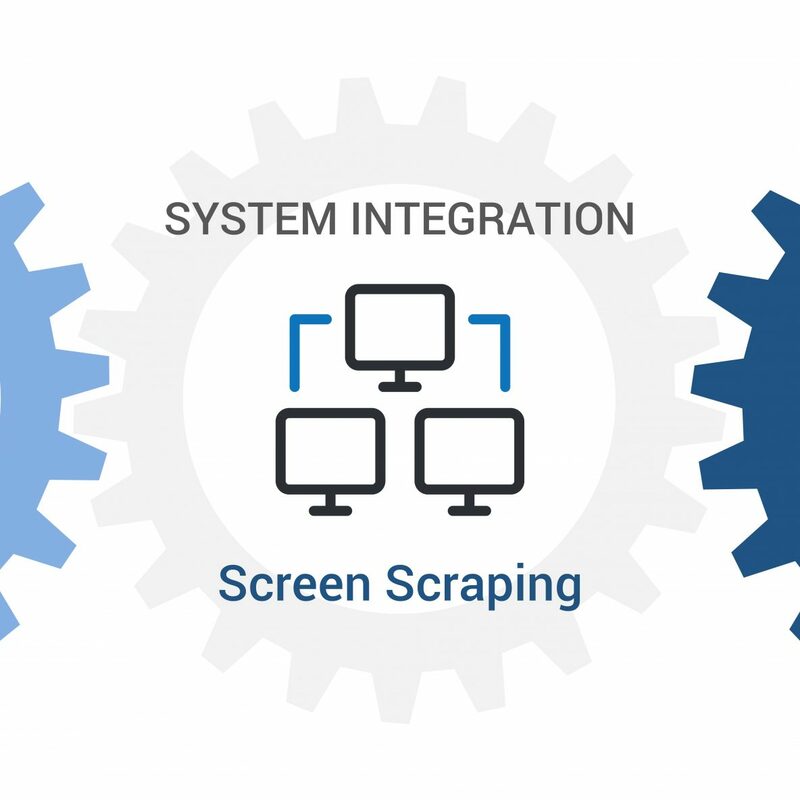 Screen scraping is key to achieving a full breadth of integration. It creates a safety net of compatibility for almost any sort of application. When considering text-based compatibility, OCR has the potential to make most documents automation-friendly through digitization. 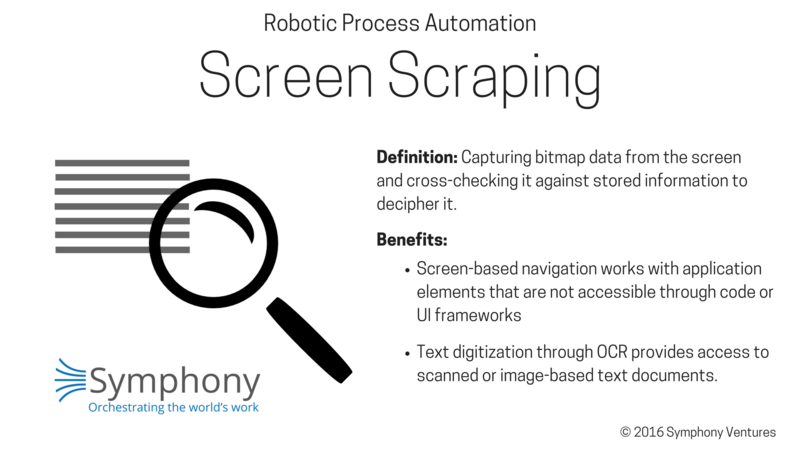 Paired with other RPA features, screen scraping can expand your business’s automation capability. Want to make sure your business selects the right tool for your screen scraping needs? Symphony can provide the answer. If you want to learn more about RPA, check out our blogs page. This is part 10 of a 22 part blog series by the leading experts at Symphony Ventures. It addresses how to choose the right RPA tools for your business needs. Drawing from our global team’s extensive knowledge in automation consulting, implementation, and managed services across a range of diverse industries, we’ve drilled into the technical criteria to consider when selecting which RPA software best enables your company’s digital operation strategy. Read part 9, How Sustainable RPA Design Can Pay Dividends Down the Road. Be sure not to miss part 11 of RPA Technical Insights, where we have a look at common application integrations.